Domenico Cirillo was a prodigy of the Enlightenment. He was from a relatively modest family in Grumo Nevano near Naples —no titles, not a lot of land— but nevertheless a family full of doctors and naturalists. They recognized his precociousness and sent him off to Naples to school at the age of seven. (Part of his early schooling included art, putting Cirillo in a position of later being able to draw most of the illustrations for his many works in botany and medicine.) He started to study medicine at the age of 15 and also attended botany lectures. When his botany professor died, Cirillo entered the selection process that was to choose a new professor. He had never published anything but was clearly so brilliant that he got the job anyway. In his first profession, botany, Cirillo carried on correspondence with the Swedish scientist Carl Linnaeus (1707 – 1778), known as the father of modern taxonomy. 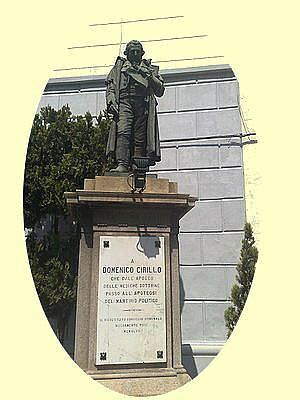 Cirillo was responsible for introducing and putting on a firm basis in southern Italy the new Linnaean taxonomic nomenclature in place of the older system of French botanist, Joseph Pitton de Tournefort. Cirillo was practically the father of modern botany in the Kingdom of Naples and spawned an entire school of pupils. Cirillo's professional life was prodigious and intense; he was one of the lights of the Neapolitan Enlightenment. He remained a professor of botany until the university reform of 1777 when he passed to the medical department. He was doctor at the Incurabili hospital, a professor of physiology and obstetrics, and was the personal physician to a good part of the Neapolitan aristocracy, including the royal family. He liked the French and English, was widely traveled and corresponded with scientists and what we would now call "social scientists" of his day. During his sojourns abroad, he became friends with the likes of Benjamin Franklin, Georges-Louis Leclerc (Comte de Buffon) and Denis Diderot. Generally speaking, that fits in with later descriptions of him as having been less of a practical researcher than one interested in developing solid teaching practices and providing for the diffusion of current scientific thought, no matter the source. He was recognized internationally and had papers presented at the Royal Society (of which he was a member) and printed in the Philosophical Transactions. As a doctor, he was interested in the social conditions of his day; among his works was De lue venerea (Naples, 1783) on the treatment of venereal disease, a work quickly translated into other European languages. In all, he published dozens of significant works in botany, medicine, entomology (a hobby! ), hygiene, and he introduced many medical innovations into Naples, including inoculation for smallpox. He even wrote a few philosophical items: I piaceri della solitudine [The Pleasures of Solitude] and Le virtù morali dell'asino [The Moral Virtues of the Donkey]. Cirillo wrote and spoke on the social conditions of his day, including the need for hospital and prison reform. There is, however, no evidence at all that he was political in the sense of advocating one form of government or social order over another. He belonged, as far as can be determined, to no Jacobin or other radical organizations that sprang up in Naples in the wake of the French Revolution. When the French army was then at the door in 1799 ready to set up a sister revolutionary republic of Naples, and the Bourbon royal family had fled to Sicily, the invitation went out from French general Championnet to civil servants, merchants, military, professionals, and any members of what might even then be called a "middle class" in the city to serve the new republic. Cirillo refused the invitation. He eventually caved in and lent his name and efforts to the new government, but his major "revolutionary" crime, besides not accompanying the royal family to Sicily, seems to have been that he sponsored a National Charity Project (donating most of his own resources) to help the needy. When the counter-revolutionary Army of the Holy Faith retook the Kingdom of Naples, Cirillo was one of those who decided to take advantage of the Royalist offer to leave for France. With others, he was, however, then retaken from ships in the bay, imprisoned and tried for treason. He refused to ask for a pardon because he said he had done nothing wrong. He was executed by hanging on October 29, 1799. Admiral Nelson said of the affair, "Domenico Cirillo, who had been the king's physician, might have been saved, but that he chose to play the fool and lie, denying that he had ever made any speeches against the government, and saying that he only took care of the poor in the hospitals" (Nelson and the Neapolitan Jacobins, Navy Records Society, 1903). After his execution, his home was invaded by bands of royalists who destroyed whatever of his scientific works they could find. Cirillo, however, is well remembered today. There are plaques and statues, of course, but also a number of schools are named for him. Besides that, there are some traces of his influence not evident to the casual observer. For example, as a great botanist, Cirillo loved gardens. One of his pupils, Vincezo Petagna, was responsbile for developing the famed Botanical Garden at Barra, near Naples, in the 1780s, and one of Petagna's pupils, Michele Tenore, then built the Botanical Garden of Naples in 1807, which you can still visit today.